Definition at line 21 of file CQMoietiesTaskResult.h. Definition at line 39 of file CQMoietiesTaskResult.cpp. Definition at line 50 of file CQMoietiesTaskResult.cpp. Definition at line 121 of file CQMoietiesTaskResult.cpp. Definition at line 132 of file CQMoietiesTaskResult.cpp. References load(), mpMoietiesTask, and CopasiWidget::mpObject. Definition at line 55 of file CQMoietiesTaskResult.cpp. References COL_AMOUNT, COL_BTN, COL_EQUATION, COL_NUMBER, COL_SPECIES, CQIconResource::icon(), mpMoietiesTask, slotCreateGlobalQuantity(), CQIconResource::tool, and CQPushButtonDelegate::ToolButton. Definition at line 129 of file CQMoietiesTaskResult.cpp. Definition at line 141 of file CQMoietiesTaskResult.cpp. References CCopasiVector< T >::begin(), COL_AMOUNT, COL_BTN, COL_EQUATION, COL_NUMBER, COL_SPECIES, CCopasiVector< T >::end(), FROM_UTF8, CCopasiRootContainer::getDatamodelList(), CCopasiDataModel::getModel(), CModel::getMoieties(), CCopasiContainer::getObject(), and CModel::getQuantityUnitsDisplayString(). Definition at line 280 of file CQMoietiesTaskResult.cpp. References COL_AMOUNT, COL_NUMBER, CopasiWidget::mFramework, and CopasiWidget::setFramework(). Definition at line 253 of file CQMoietiesTaskResult.cpp. References ListViews::ADD, C_INT32, CModel::createModelValue(), CCopasiRootContainer::getDatamodelList(), CMoiety::getExpression(), CModel::getMoieties(), CCopasiObject::getObjectName(), ListViews::MODELVALUE, CopasiWidget::protectedNotify(), CModelEntity::setInitialExpression(), CCopasiVector< T >::size(), and TO_UTF8. Definition at line 223 of file CQMoietiesTaskResult.cpp. References C_INT32, checkSelection(), CLocaleString::fromUtf8(), CCopasiTask::getResult(), CopasiFileDialog::getSaveFileName(), mpMoietiesTask, and TO_UTF8. 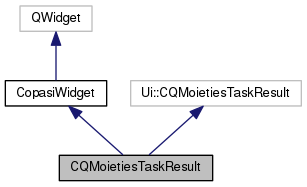 Definition at line 90 of file CQMoietiesTaskResult.cpp. References ListViews::ADD, ListViews::CHANGE, clear(), and ListViews::MODEL. Definition at line 38 of file CQMoietiesTaskResult.h. Referenced by enterProtected(), init(), and slotSave().